I don’t get what makes them tick. We find out this week that the sole reason Connie even came to Japan was just to see Ayano. Wait, that’s not quite right. She didn’t come here just to see the girl. She came here to ask Ayano if they could be family. Family. Yo, you’ve never even met the girl until recently! 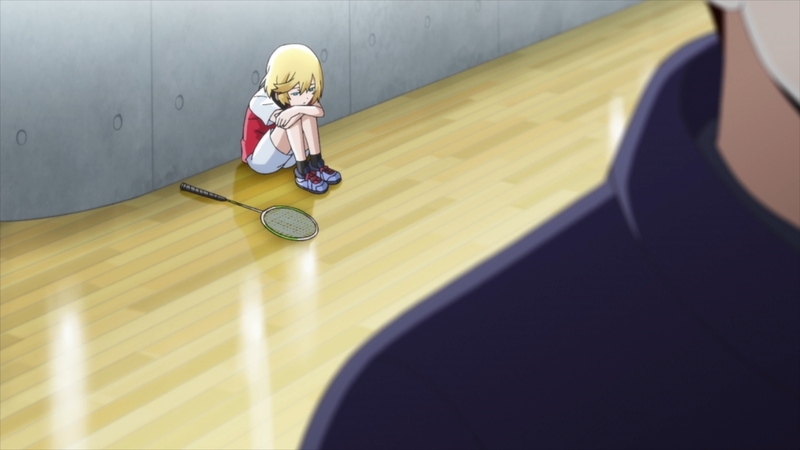 So she was a lonely child, and nobody ever talked to her until Uchika came along. When Ayano’s mother started paying attention to Connie, this left an indelible impression. From then on, the Danish girl has been obsessed with the idea of her, Uchika, and Ayano being one big, happy family. 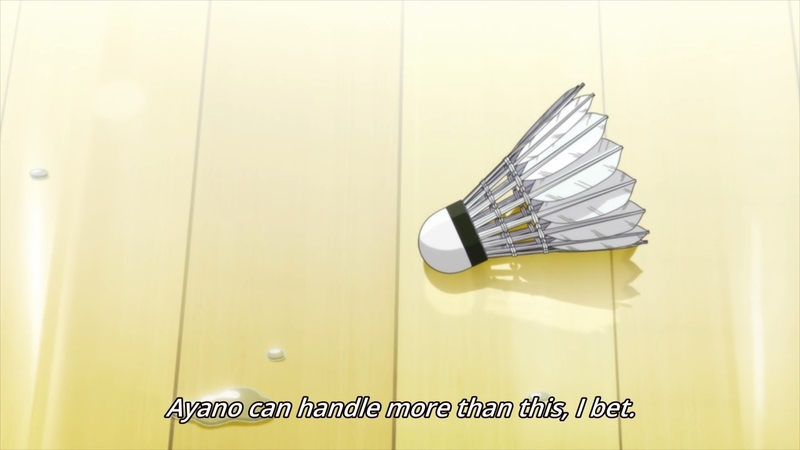 She even pushed herself to get insanely good at badminton just to live up to this seemingly mythological idea that Ayano must be even better at the sport (which is actually kinda true). So then why was Connie so mean to the girl at summer camp? 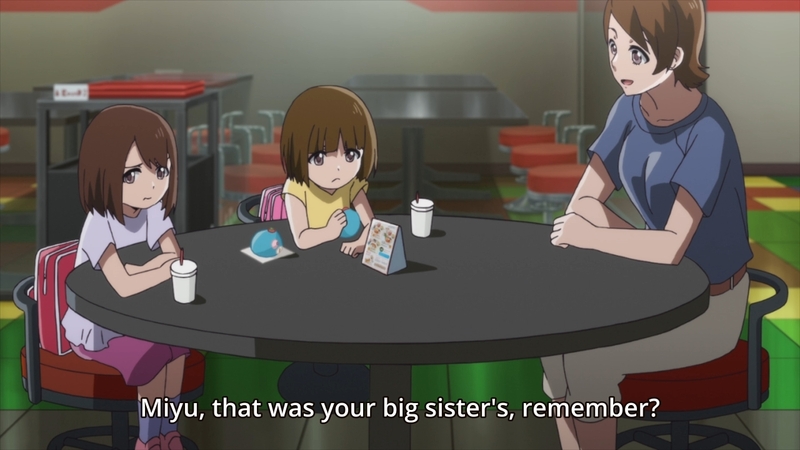 Remember, she thought Ayano was hiding her identity at first. 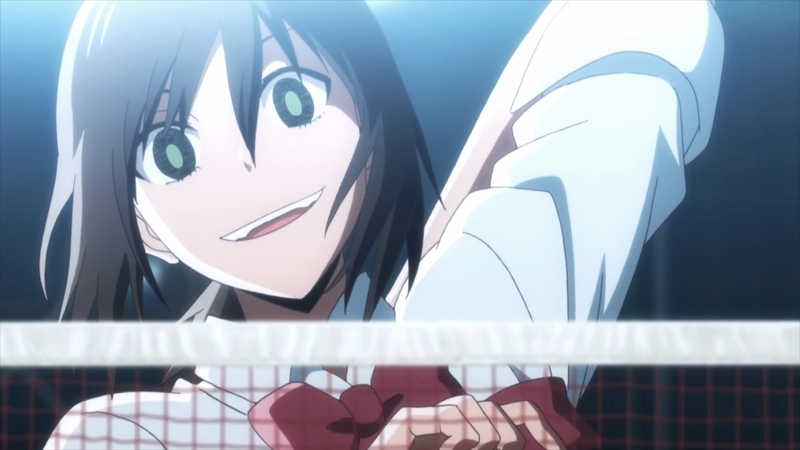 Then after their doubles match, Connie swore that she would beat Ayano just so that Uchika would acknowledge her. So what’s with the sisterly act now? 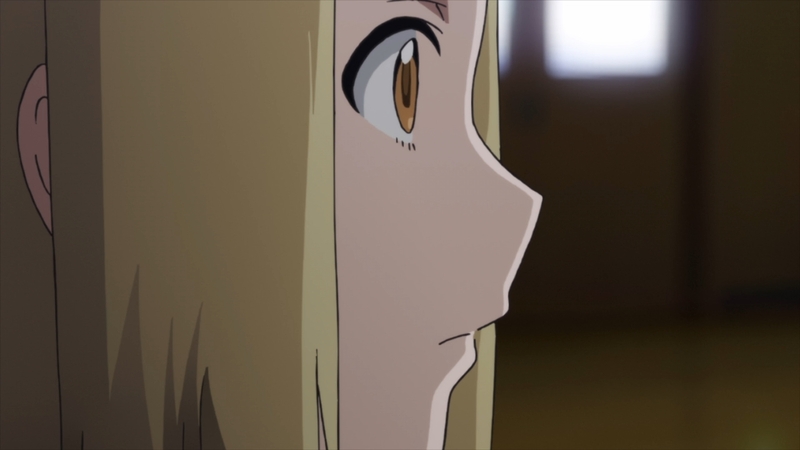 And even if it was never her intention to hurt Ayano back then, why on earth does Connie think that the girl would suddenly be receptive to the idea of them being a family? Where’s the common sense? 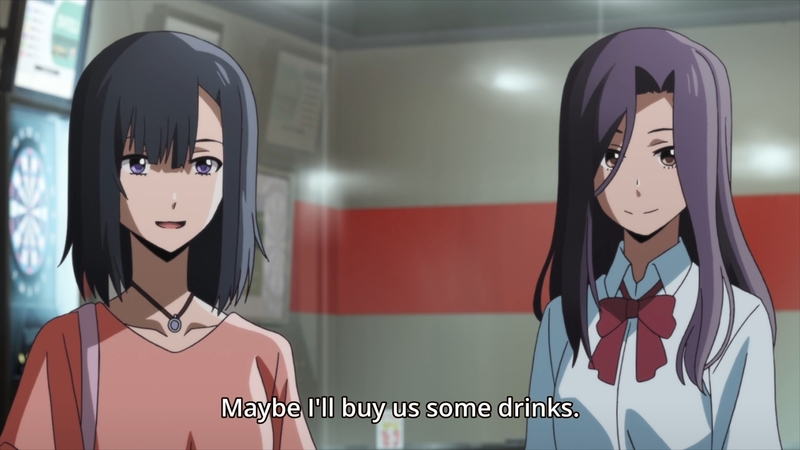 Or is she really so socially awkward that she honestly thinks some heartfelt appeal would convince Ayano that everything’s all good between them? 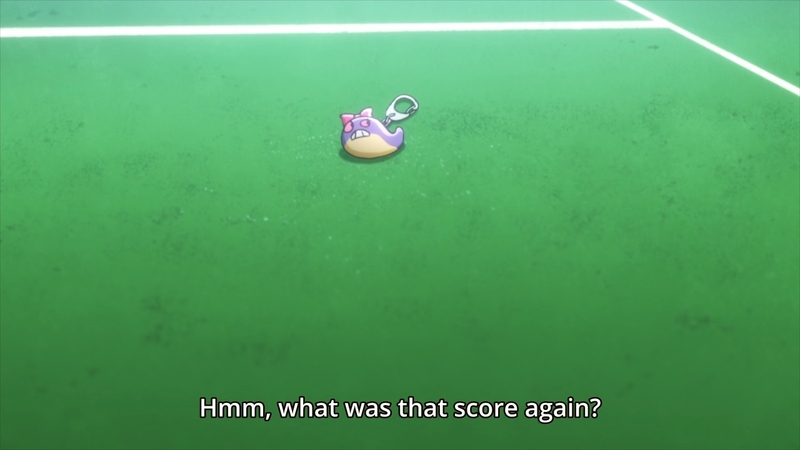 I can’t really blame Ayano for shooting Connie down. She has no emotional connection to this girl whatsoever. None at all. 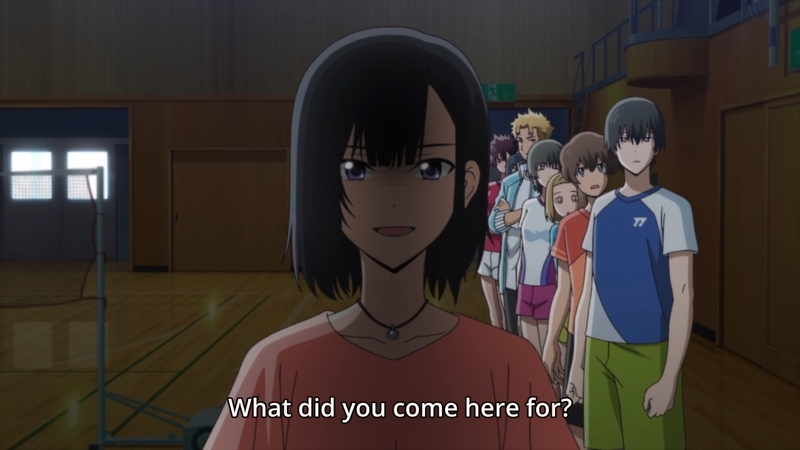 She was just trying to have a nice summer camp with her teammates when some haughty girl comes out of nowhere and humiliates her on the court by winning 1v2. This stranger then proceeds to talk all this trash about how having a team is meaningless if your mother doesn’t acknowledge you. Gee, who was abandoned for years by her mother? Who had to see a picture of her mother posing for a photo with some new girl? Who gave up on a sport she loved because playing it would dredge up so many painful memories? Memories about how her mother must have left her because she wasn’t good enough? Whether this is actually true or not, who knows? But at this point, it probably doesn’t matter what Uchika has to say, because if I was in Ayano’s position, I’d be resentful too. I’d honestly cut Uchika out of my life completely. Unless she was literally forced to leave the country for some bizarre government conspiracy involving aliens and the Freemasons, she has no excuse for abandoning her only daughter just to shack up with another girl and feed her crazy ideas of them being one big, happy family! I’m sorry, but this is just wild. Who does that? Who? What reason could she possibly give that would wipe away all those years of tears and anguish? 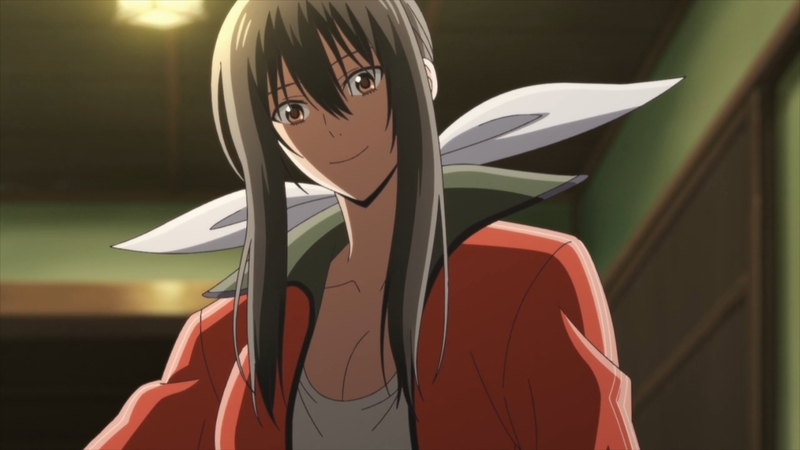 — During practice, Yu finds herself staring at Hayama a lot. I guess she has a crush on him. 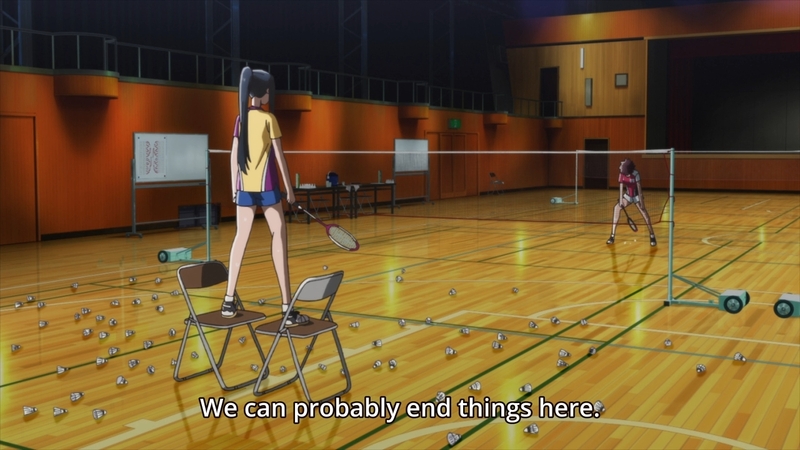 — Ayano and Nagisa have yet to play in the finals. I still don’t expect them to play a complete match. It would just be career suicide for the latter. Part of being an athlete is understanding your limits. — All of a sudden, Connie makes her grand entrance. How did she get up there without anybody noticing her? Who drew the curtains back? — We learn that Connie and Yuika will serve as Inter-High representatives for their high school. I don’t think I’ve actually seen the latter play a match. — Meanwhile, Ayano can’t help but point out that she can see up Connie’s skirt. Okay then. 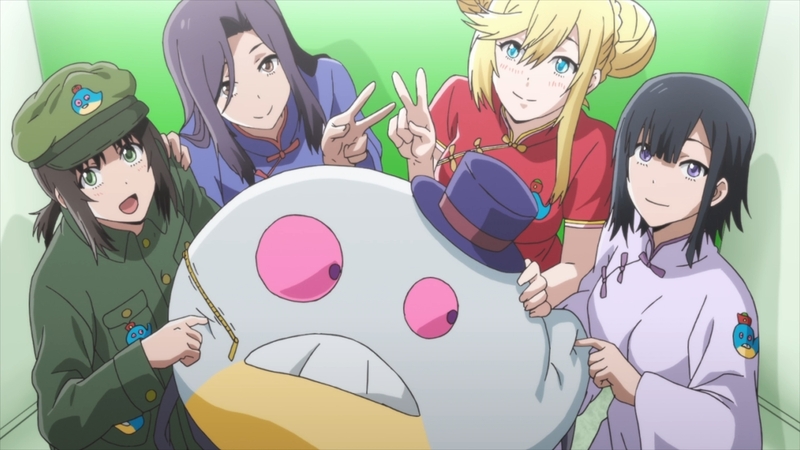 I guess this episode will start out by being a little silly and light-hearted. — Connie insists on having a one-on-one with Ayano right there and then. Our heroine has a big match coming up, so it’s not necessarily in her best interest to push herself too hard in a random exhibition match. Nevertheless, she agrees to play Connie anyways since she’s currently in the zone. 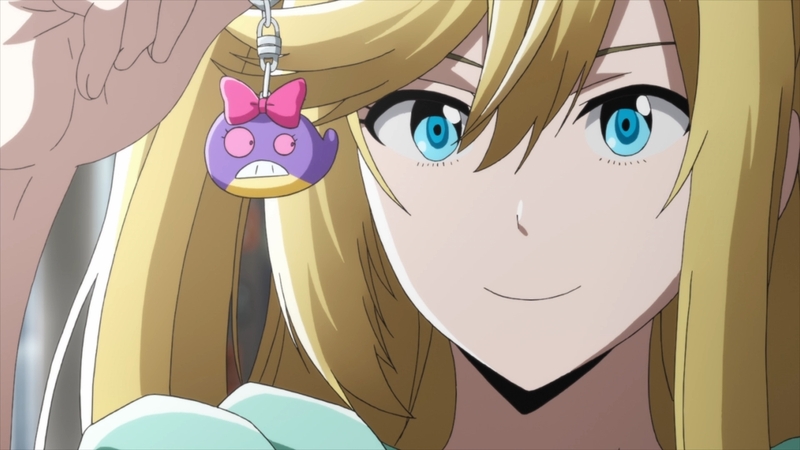 According to Kaoruko, Ayano is not quite back to her former levels of greatness, but she probably still feels that she’s good enough to beat anyone in this room. — Unfortunately, her whale-themed bag accessory broke so they can’t play…? — Connie looks tough, but she’s actually rather submissive to her team captain. — We get to watch Yu stare at Hayama some more, but the boys have barely gotten any character development in this series. As a result, it’s hard to understand what the girl sees in the guy. 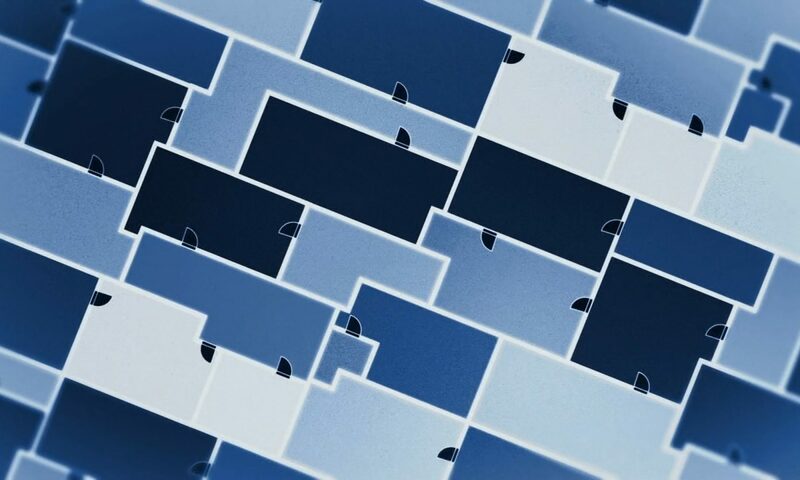 Plus, this is C-plot material. 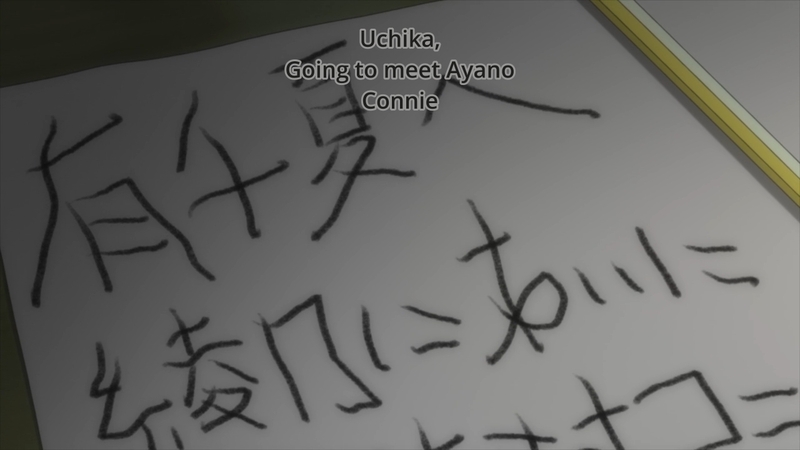 I’m only really interested in seeing what unfolds between Ayano and Connie. It’s hard to care about Yu’s little crush. 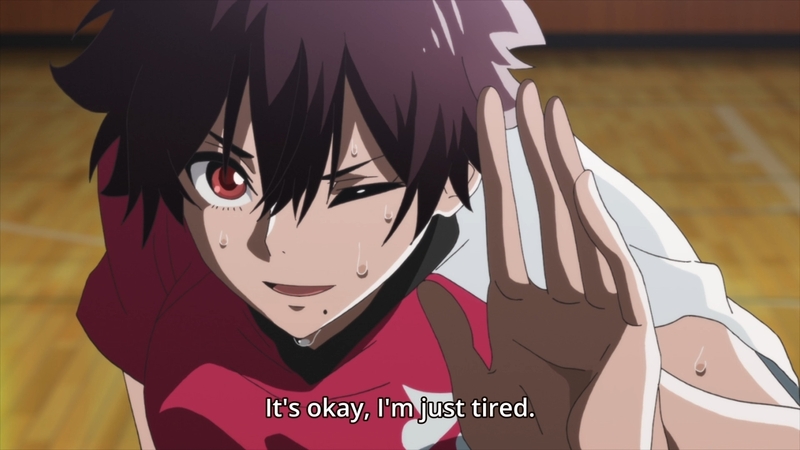 — Kentarou tells Nagisa that she needs to get some rest, but he isn’t firm about it. He ultimately lets her do whatever she wants to do even though he should know better than this. He should know that she’s still a child, so she might underestimate the strain she’s putting on herself. Look, kids always think they’re invincible. They always think nothing bad could happen to them. It’s up to the adults to protect them. Kentarou isn’t doing his job. Week in and week out, I find myself disappointed by this guy’s presence in the anime. 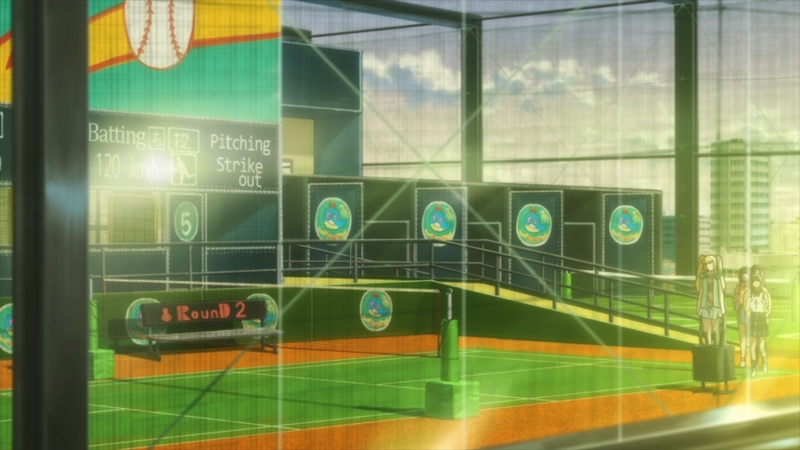 — At this amusement center, all of Ayano’s childish dreams come true. Well, almost all of them. 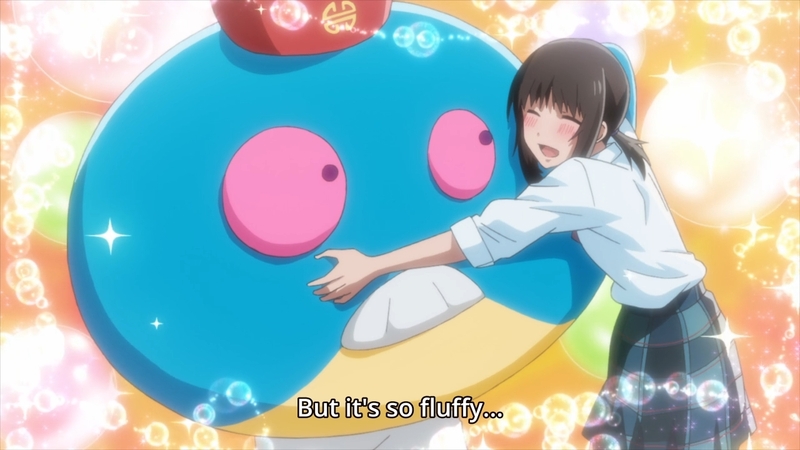 She doesn’t get her mother back, but on the plus side, she does get to hug a mascot, play a crane game, and even cosplay as a Chinese communist! — They’re pushing the nice Connie angle so hard when she was so mean the last time we saw her. 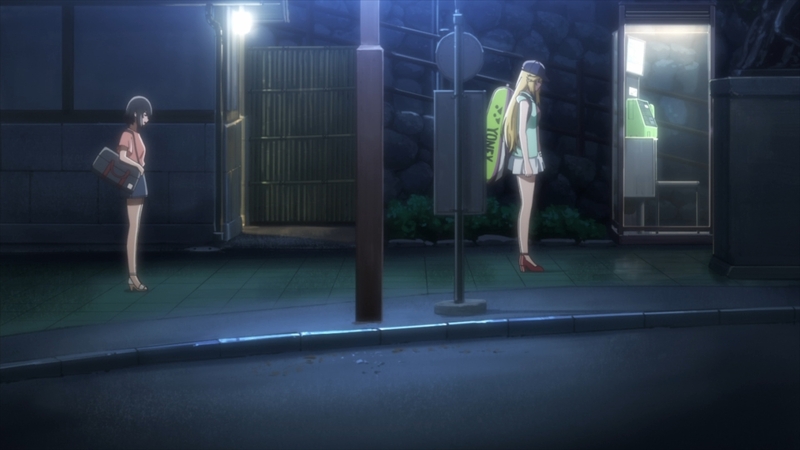 The blonde girl actually steps off to the side at one point to win one of those bag accessories. 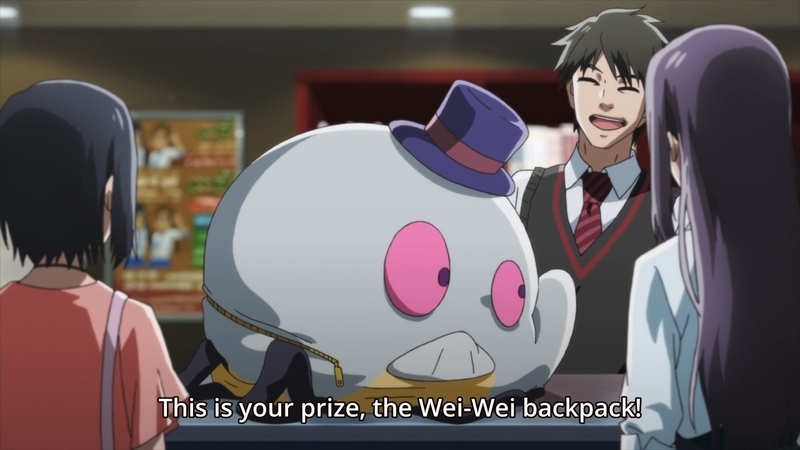 She had intended to gift it to Ayano, but Yuika just had to go and upstage her teammate by winning this giant, ugly Wei-Wei backpack. 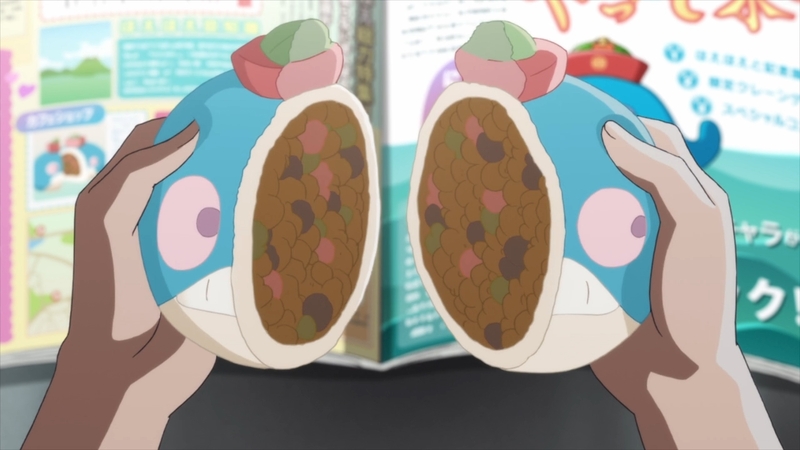 — Man, even the meat buns are shaped and colored like Wei-Wei. — Yuika and Elena look like two mothers looking after their two bratty children. 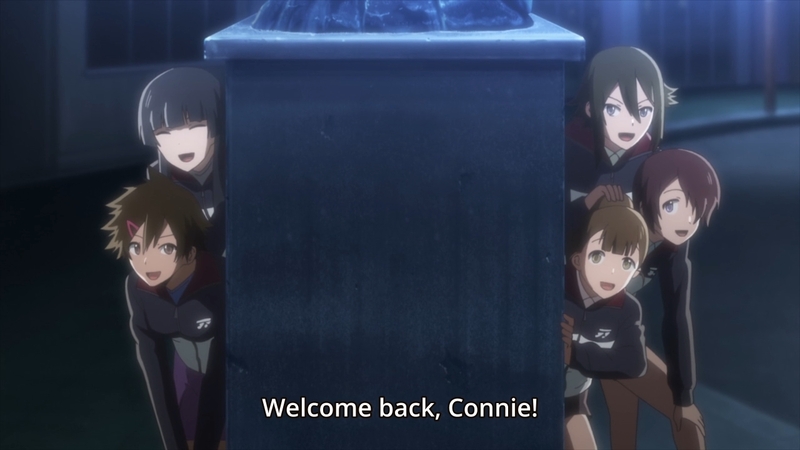 At one point, they leave Connie and Ayano alone. 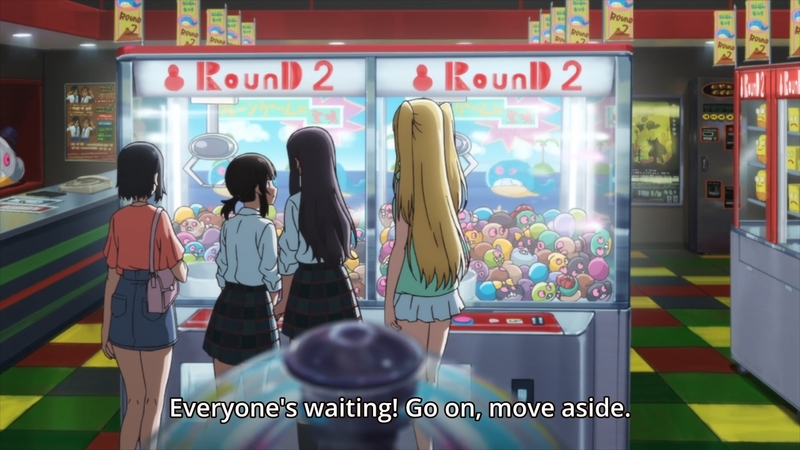 Yuika knows that her teammate has something to get off her chest, but Connie almost chickens out at the last second. Luckily, there’s a mother sitting with her two daughters at a nearby table. The two daughters are also conveniently fighting with each other. 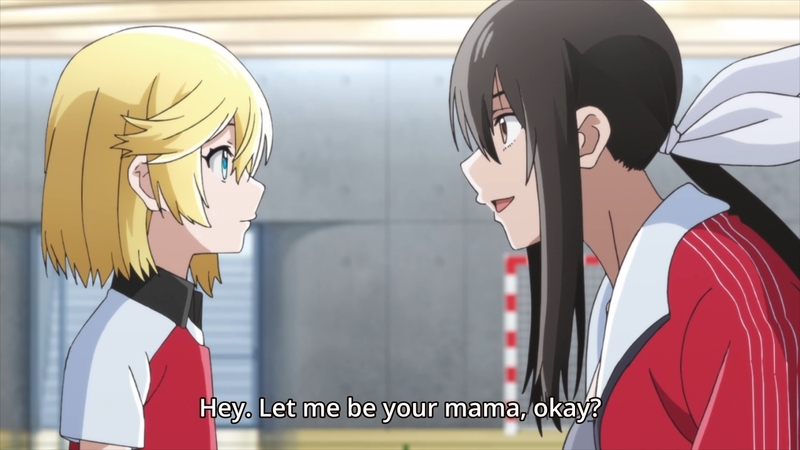 Seeing the girls make up and leave happily with their mother, Connie finally gets the courage to talk to Ayano. — She finally tells the girl that she would like to be family with her. Well, that’s kinda sweet, I guess. A little forward, but a sweet sentiment nonetheless. Connie then adds, “Let’s live together!” Um, what? — Ayano doesn’t immediately give Connie an answer. 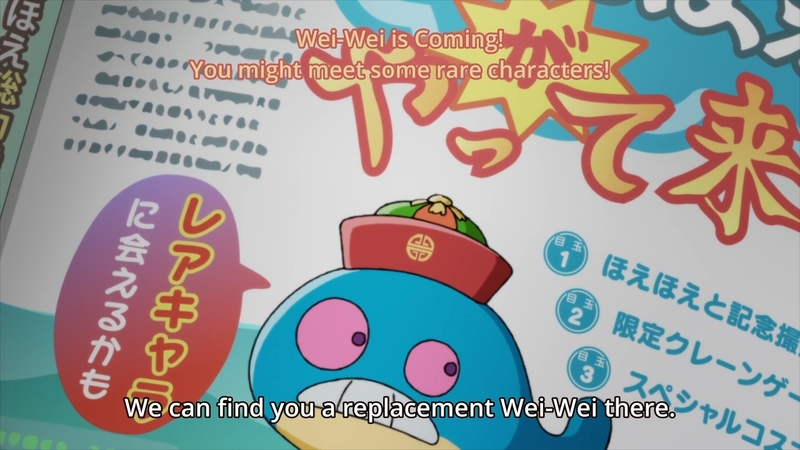 Instead, she drags everyone to a nearby sports center that is also plastered with Wei-Wei’s image. 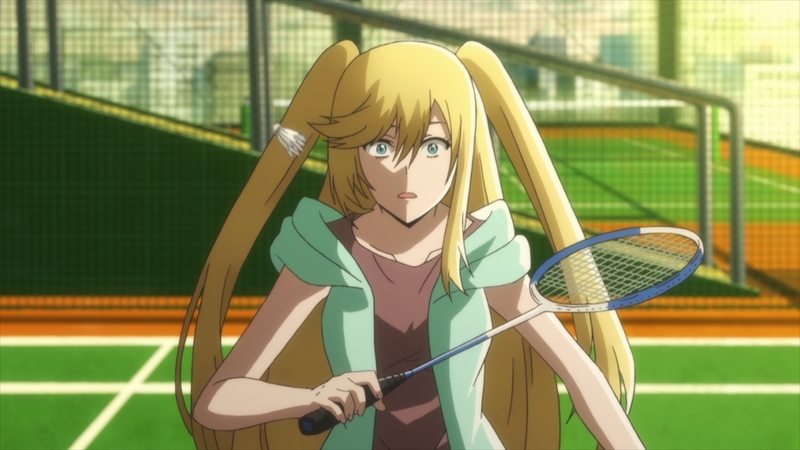 Oh boy, looks like our heroine’s response is a game of badminton..
— The match starts with Ayano taking a huge cut at the shuttle, which leaves Connie feeling somewhat shell-shocked. As it plays out, the Danish girl soon discovers that this isn’t the same Ayano she faced back at summer camp. This Ayano might not yet have regained her peak form, but she’s still winning easily. Part of that might just because Connie isn’t focused, though. She’s all emotionally torn up. — Elsewhere, Yu asks Sora about the boys. 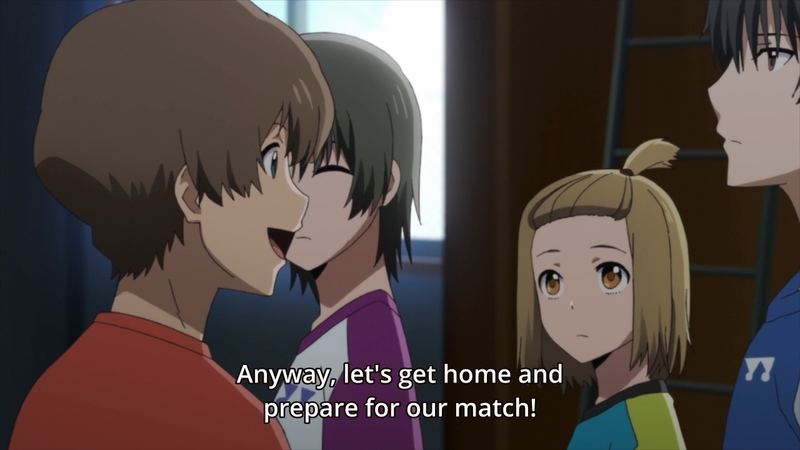 Specifically, she wonders if Sora’s brother had convince Sora and Hayama to play badminton. The latter replies that it was actually Hayama’s idea. 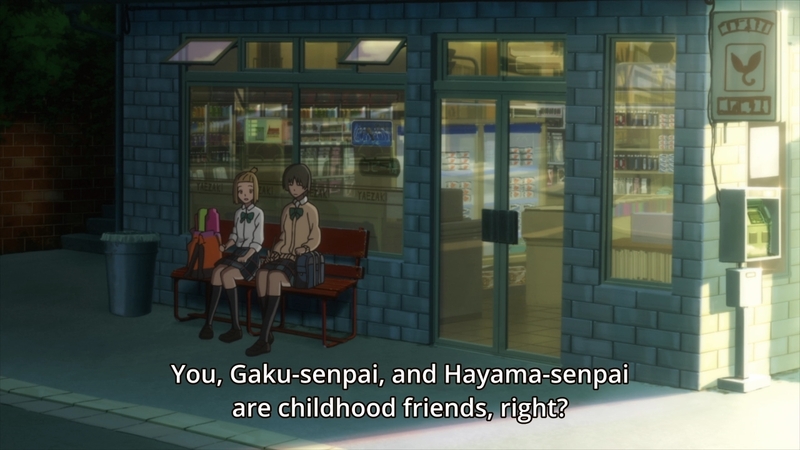 Upon hearing this, Yu cuts their hang-out short. 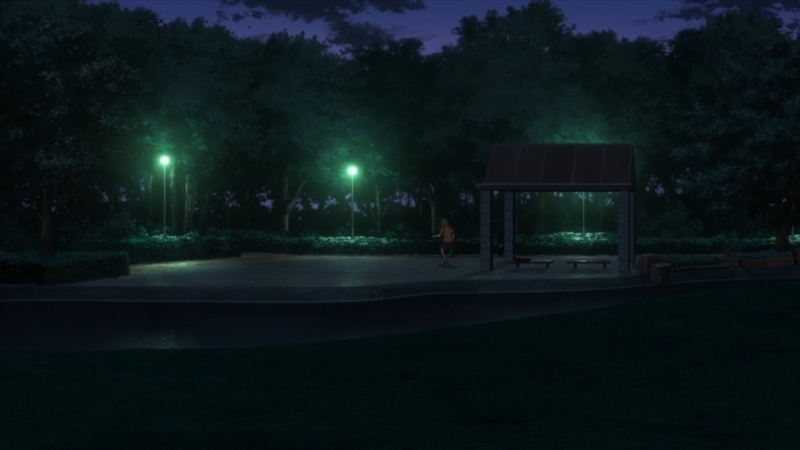 We’ll find out later that she had decided to go to the park to see the guy she likes. 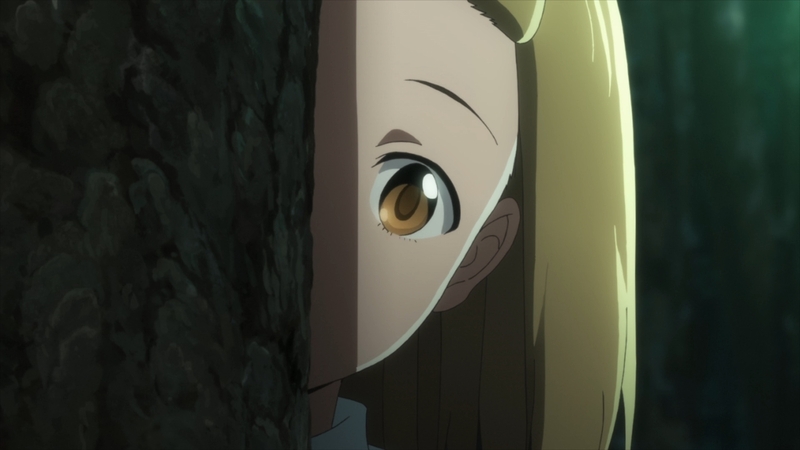 She even creeps on him from behind a tree. She has a Pocari Sweat as an ice breaker, but unfortunately, she hesitated. 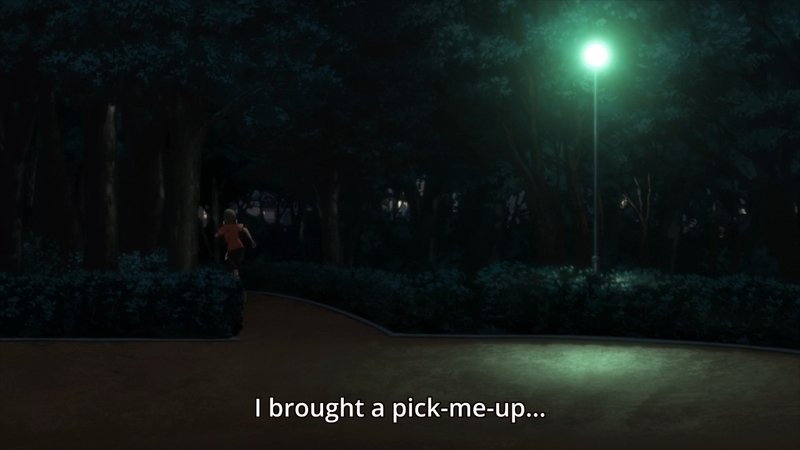 As a result, he takes off on a jog without even noticing her. In the end, Yu decides not to stick around. Well, you’re not going to win if you’re not even try. 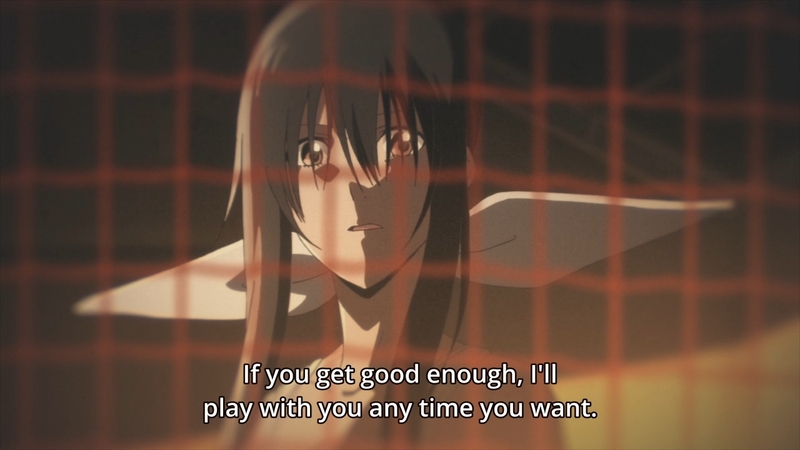 Still, I wonder if she felt like she had to make her feelings known just in case there’s something going on between Sora and Hayama. — But that’s enough about the C-plot. 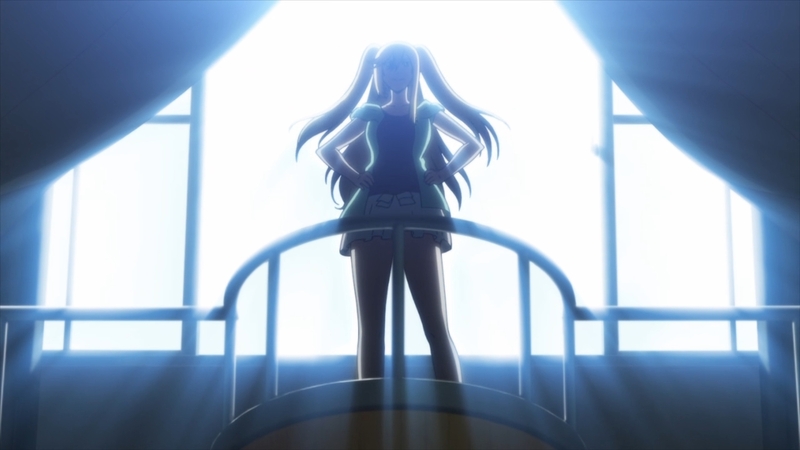 We briefly revisit the gym to see that Nagisa is still going at it. Riko can tell that the girl desperately needs to take a break, but she’s too soft. Her best friend says please, and she immediately falters. If you love someone, you can’t let them hurt themselves. Sometimes, that means temporarily being the bad guy. Besides, even if her knee wasn’t in bad shape, her body still needs to rest. When you’re tired, that means you need to stop. — Imagine waking up at night, rolling over to look at your girlfriend, and seeing this face staring back at you. — We get a long, extended flashback regarding Connie’s backstory, but I more or less went over that in the main body text up top. So instead, we’ll just focus on this match, which is definitely not going well for Connie. 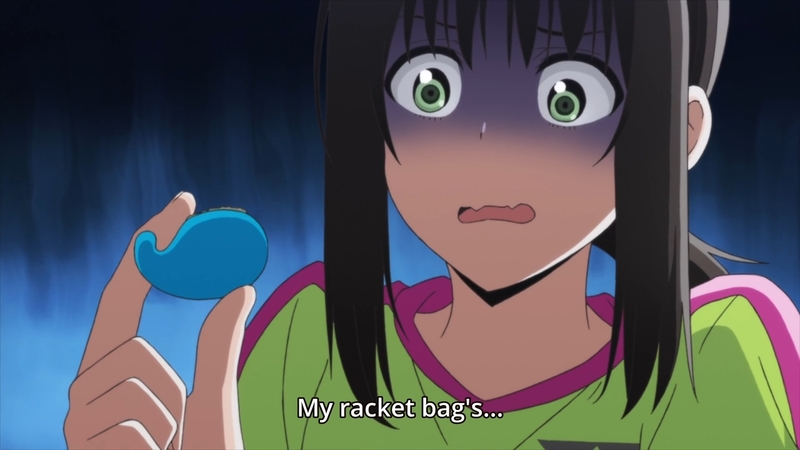 After a particularly bad point, that Wei-Wei bag accessory falls out of her pocket. 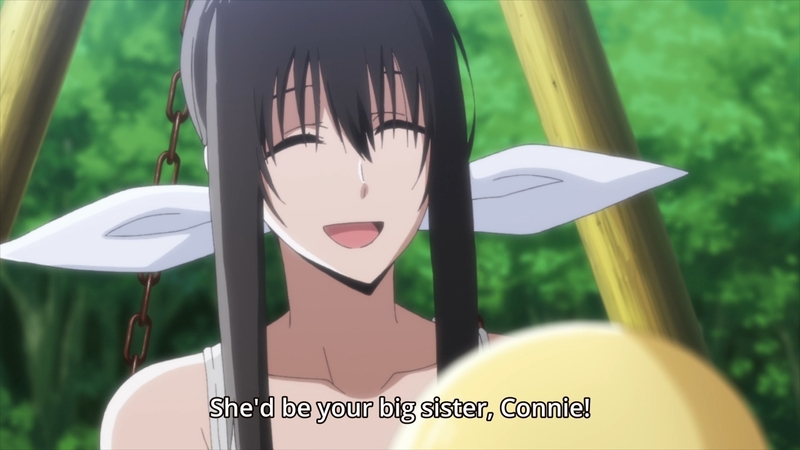 Needless to say, Ayano won’t be accepting anything from Connie anytime soon. — Ayano eventually walks up to Connie and tells her that it would be impossible for the three of them to be a family. 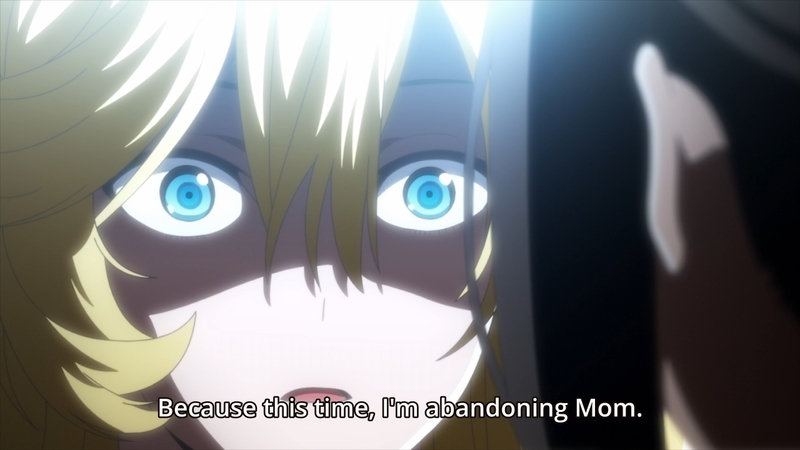 After all, who ever said she even wants her mother back anymore? — We don’t get to see how the rest of the match ended. Presumably, everyone just went their separate ways. 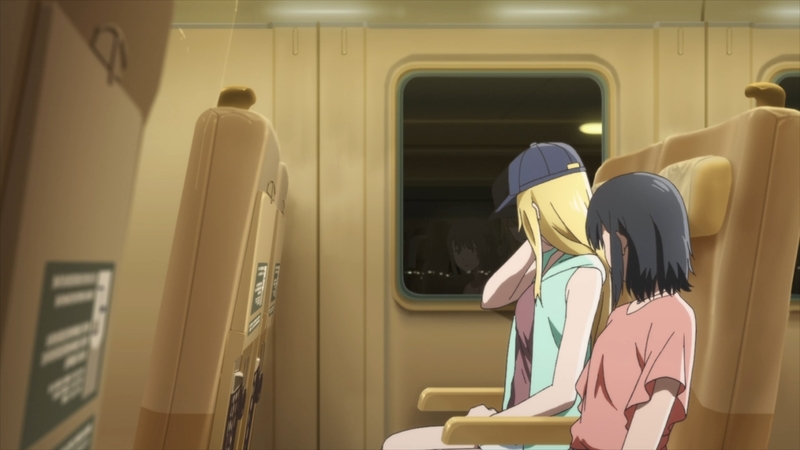 The next time we see Connie and Yuika, they’re already headed home on the train. The blonde girl understandably looks defeated, but like I said up top, I really don’t know what she honestly expected. There was no chance in hell that someone you’ve never met would just instantly greet you with open arms. 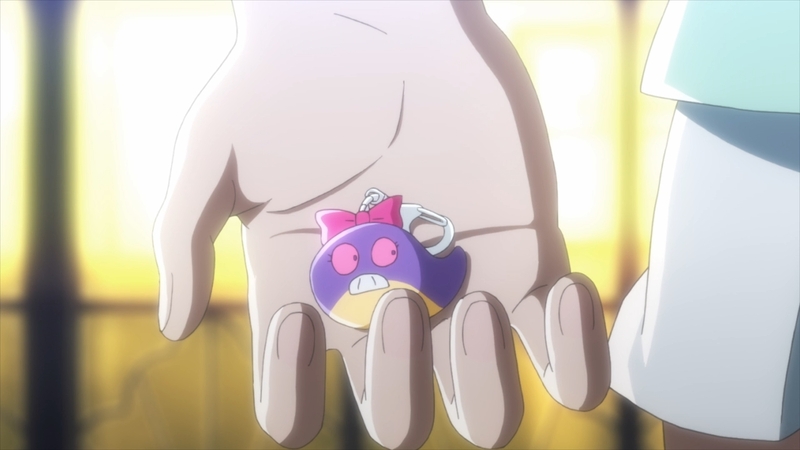 — Luckily, it appears as though Yuika had picked up that Wei-Wei bag accessory. 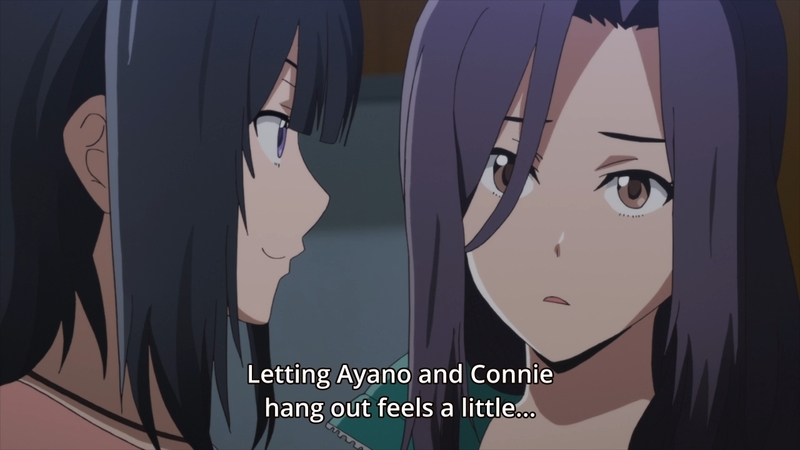 Yuika will later insist that Connie try again with Ayano in the future. This is anime, so there’s a solid chance everything will work out in the end. — After the train ride, Connie doesn’t say anything. She just wants to sulk in silence. Her teammates won’t let her, though. They’ve all come out to welcome her back with open arms. It’s super sweet if you ignore the context. Even though her mission to become close to her “big sis” didn’t quite work out, she still has another family to support and love her. It’s just horribly unfair if you think about it. Uchika left Ayano and spent years raising Connie. And now that Connie’s in Japan, she told Ayano that having a team was pointless… just to turn around and have her own team pick her up after a painful experience. 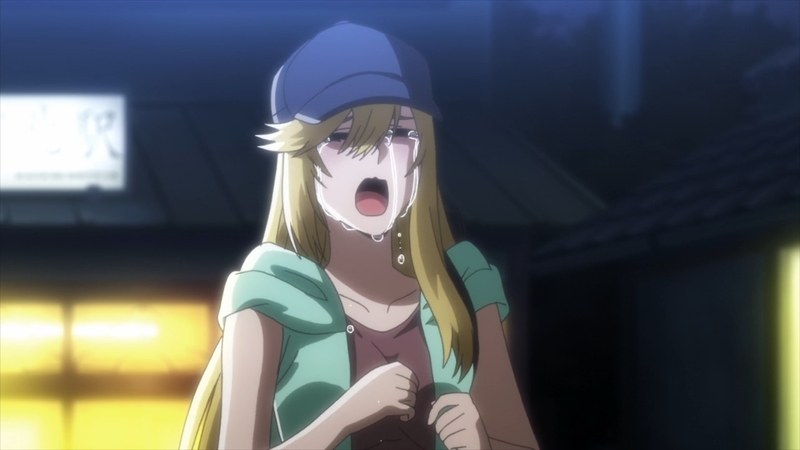 — Connie’s VA’s crying performance was not… well, it was not very convincing, I’ll just say. — And what does Ayano get? When she gets home, she gets to meet the woman who abandoned her. 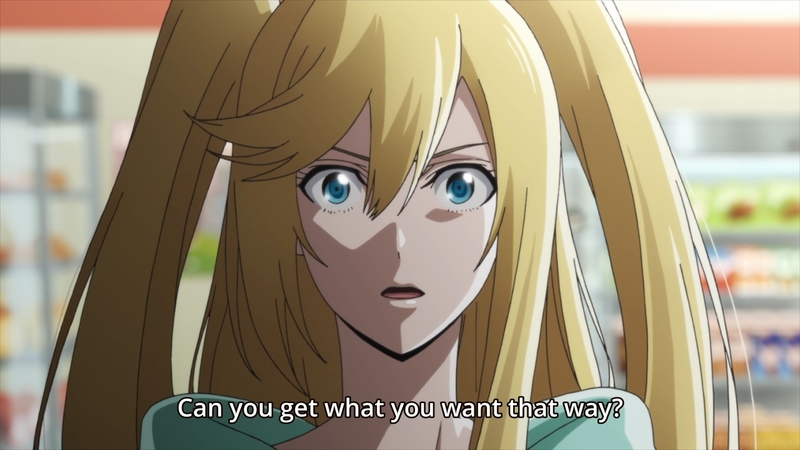 CategoriesAnime, Hanebado!, Series TagsAnime, Hanebado! I haven’t read it myself, but I’ve been told that in the manga Connie acted completely different during the summer camp arc, more in line with her personality in this episode. So my best guess is that they wanted to spice up her first encounter with Ayano with an extra dose of drama, but I’m not sure why they thought they could just change her back to normal for this episode. It’s really jarring. 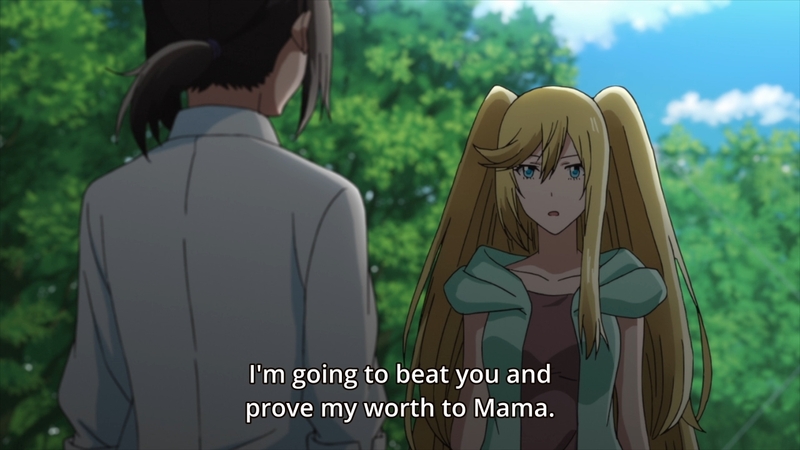 In the manga, Connie was still prideful and pushy (she still wanted to play quasi-solo against Ayano/Riko), but she wasn’t evil towards Ayano like she was in the anime (where she essentially rubbed in Ayano’s face that her mother was with HER now and Ayano was unneeded). 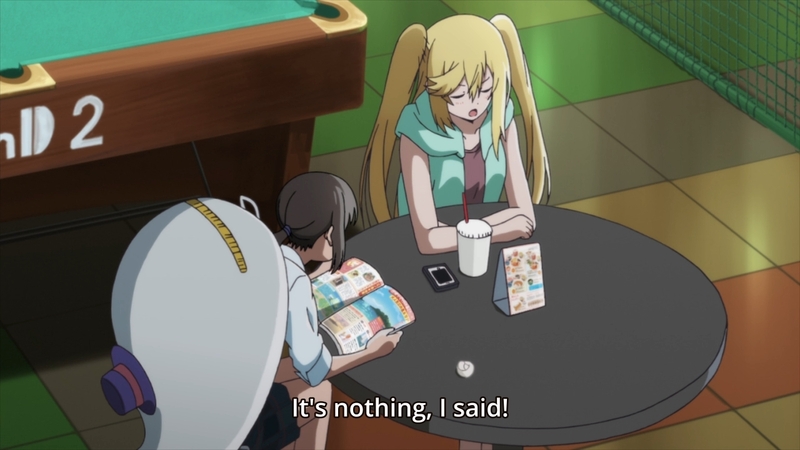 Rather, Connie offered Ayano to tell her more about her mother the next time they met at Interhigh (in a playful-friendly way – Connie clearly wanted to rekindle Ayano’s fire for badminton). Connie didn’t win this match either, and they all parted on perfectly good terms. As you can see, under _these_ conditions, Connie’s reaction is much more understandable. 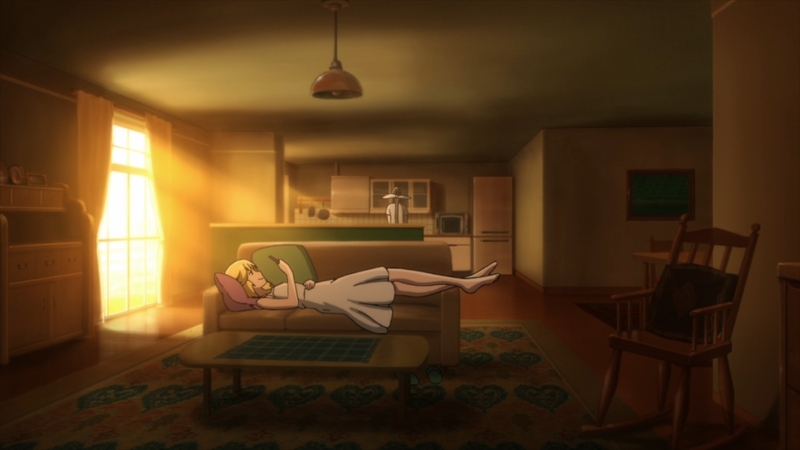 The anime sacrificed consistency for max drama. Not a good choice here.